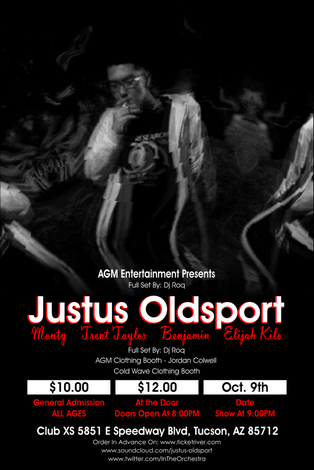 The "Justus Oldsport" show will be hosted at Club XS this Oct. 9th 2015. Justus Oldsport is a 17 year old Tucson rapper with underlying acid jazz, and soul sounds in his music. The show will feature heavy theatrics and breathtaking visuals delivered with a trip through auditory excellence. AGM Entertainment (Association of Genius Minds) is hosting the event as well as presenting openers: Monty, Trent Taylor, Benjamin, & Elijah Kilo. The entire shows set will be djayed by Dj Roq. The show is an all ages event, a bar will be provided along with merchandise booths. NO OUTSIDE FOOD OR DRINK ALLOWED IN VENUE. The show is $10.00 general admission if purchased in advance. The tickets will be $12.00 at the door the day of the show.